^ 1.0 1.1 （英文） U.S. and Canadian Institutions Listed by Fiscal Year 2013 (PDF). National Association of College and University Business Officers and Commonfund Institute. [2014-01-29]. （原始内容 (PDF)存档于2014-02-01）. ^ 3.0 3.1 （英文） Faculties and Allied Institutions (PDF). Office of the Provost, Harvard University. 2009 [2010-08-27]. （原始内容 (PDF)存档于2012-09-05）. ^ （英文） Harvard Office of News and Public Affairs. Harvard guide intro. Harvard University. 2007-07-26 [2010-08-29]. （原始内容存档于2007-07-26）. ^ （英文） Schwager, Sally. Taking up the Challenge: The Origins of Radcliffe. (编) Laurel Thatcher Ulrich (ed.). Yards and Gates: Gender in Harvard and Radcliffe History. New York: Palgrave Macmillan. 2004: 115. ISBN 1-4039-6098-4. ^ （英文） Biography - Office of the President. Harvard University. [2013-12-15]. （原始内容存档于2011-07-26）. ^ （英文） Details M2 Cambridge Shuttle 请检查|url=值 (帮助). MASCO. [2013-06-14]. 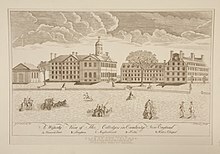 ^ （英文） This month in Harvard History. ...Edward Harkness’s $3 million gift for an “Honor College,” the seed of the Harvard undergraduate House system. ^ （英文） Villa I Tatti: The Harvard University Center for Italian Renaissance Studies. Itatti.it. [2013-06-18]. （原始内容存档于2013-05-21）. ^ （英文） Office for Sustainability: History. Harvard University. [2009-10-30]. （原始内容存档于2009-10-30）. ^ （英文） Office for Sustainability: Mission. Harvard University. [2009-10-30]. （原始内容存档于2009-12-27）. ^ （英文） Wingfield, Brian. America's Greenest Colleges. Forbes. [2008-05-21]. （原始内容存档于2012-12-09）. ^ （英文） Roster of Institutions. Commission on Institutions of Higher Education, New England Association of Schools and Colleges. [2010-08-28]. （原始内容存档于2013-08-28）. ^ （英文） Fields of Concentration. Handbook for Students. Harvard College. [2010-08-28]. （原始内容存档于2012-08-03）. ^ （英文） Degree Programs (PDF). Graduate School of Arts and Sciences Handbook: 28–30. [2010-08-28]. （原始内容 (PDF)存档于2015-09-09）. ^ 65.0 65.1 （英文） Degrees Conferred by Program: Academic Year 2008–2009 (PDF). Institutional Research, Office of the Provost, Harvard University. [2010-08-28]. （原始内容 (PDF)存档于2010-06-11）. ^ （英文） Academic Information: The Core Curricilum Requirement. Handbook for Students. Harvard College. [2010-08-28]. （原始内容存档于2010-12-05）. ^ （英文） Academic Information: Program in General Education Requirement. Handbook for Students. Harvard College. [2010-08-28]. （原始内容存档于2010-12-05）. ^ （英文） Academic Information: Rate of Work. Handbook for Students. Harvard College. [2010-08-28]. （原始内容存档于2010-12-05）. ^ （英文） Academic Information: The Concentration Requirement. Handbook for Students. Harvard College. [2010-08-28]. （原始内容存档于2010-12-05）. ^ （英文） Academic Information: Requirements for Honors Degrees. Handbook for Students. Harvard College. [2010-08-28]. （原始内容存档于2010-12-05）. ^ （英文） Kohn, A. The Dangerous Myth of Grade Inflation. The Chronicle of Higher Education. 2002-11-08. （原始内容存档于2006-04-09）. ^ 81.0 81.1 （英文） Tuition at Harvard Schools: FY1990 – FY2010 (PDF). Harvard University. [2010-08-28]. （原始内容 (PDF)存档于2010-10-10）. ^ Ted Nesi. Brown slips in world university rankings. Providence Business News. 2009-10-09 [2016-09-07]. （原始内容存档于2009-10-15）. ^ 99.0 99.1 （英文） Degree Student Head Count: Fall 2010 (PDF). Harvard University. [2013-03-11]. （原始内容 (PDF)存档于2013-04-18）. 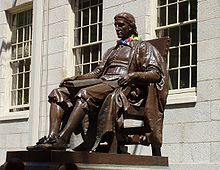 ^ （英文） The Harvard Guide: Financial Aid at Harvard. Harvard University. 2006-09-02 [2010-08-29]. （原始内容存档于2006-09-02）. ^ （英文） E.O. Wilson Biography. （原始内容存档于2015-09-18）. The following year, he joined the Harvard faculty, a relationship that was to last his entire career. ^ （英文） History of American Civilization Program. Henry Louis Gates, Jr.. Harvard University. 2008 [2008-08-07]. （原始内容存档于2008-07-24）.